DEL MAR — Will it make traffic worse? Could it actually decrease pedestrian safety? What’s the rush? 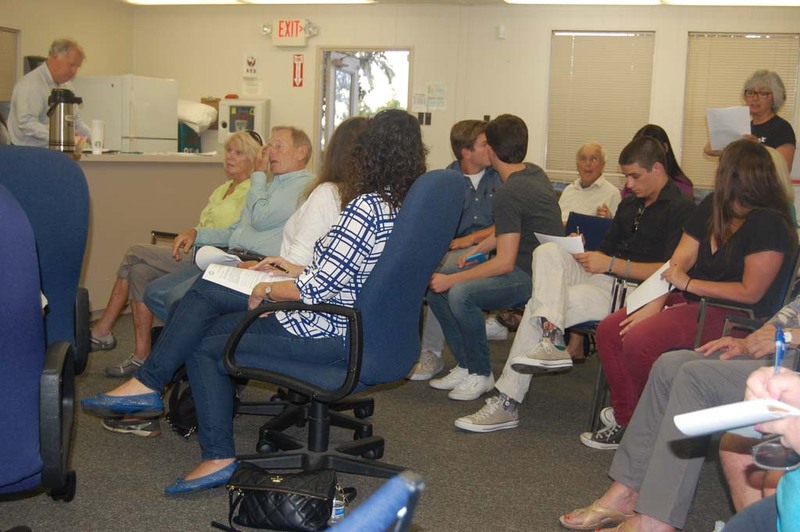 Those were some of the questions from the 40 or so residents who attended an April 30 scoping meeting at City Hall Annex to identify issues that should be studied as part of the environmental impact review process for proposed changes at the intersection of Jimmy Durante Boulevard and San Dieguito Drive. Directors from the Planning, Public Works and Engineering departments, who were on hand with traffic and environmental consultants, said the long-established community plan calls for citywide improvements that discourage automobiles and make Del Mar more bicycle and pedestrian friendly. Changes to the intersection at the north entrance to the city have been in the works for about three years and were part of an ongoing citywide sidewalk improvement project. A roundabout was proposed when plans were made in that area of town. After residents voiced concerns about the traffic calming device it was pulled for a separate study to avoid delaying that project. “It made sense to not do work twice but clearly people wanted a more extensive look,” Public Works Director Eric Minicilli said. The project calls for a roundabout with a 64-foot inside diameter, curbs and gutters, landscaping and crosswalks to slow speeds, improve traffic flow and pedestrian and bicycle safety. “The intersection, broken as it is, works,” Barbara Stegman, who lives on San Dieguito Drive, said. Minicilli agreed, saying Jimmy Durante currently “does an excellent job pushing cars” through the area at 45 or 50 mph with not a lot of accidents. “It does what it was designed to do,” he said, adding that city officials have discussed making the area safer. “Clearly it’s safer to have lower speeds,” he said. While some residents have said they don’t want decreased speeds, that conflicts with the community plan, he added. Minicilli said doing nothing is a viable option but other people have said they want to slow down cars on that part of the road. Some residents said they fear a roundabout will make things worse, especially during the San Diego County Fair and summer horse racing season. They claim it will draw people leaving the fairgrounds because unlike the current situation motorists will be able to legally turn around at the intersection to get back to the freeway. They say traffic will likely come to a standstill and residents of San Dieguito Drive won’t be able exit their neighborhood. Traffic consultant Dawn Wilson, from Fehr & Peers, said plans are to study the intersection with a roundabout, a traffic signal and no changes. She said new traffic data will be collected during the fair and typical days, but not during this year’s race season because of timing. She said information collected during the races over the past two years will be used, a fact that did not sit well with some residents. “You need to make a count during the actual time we’re suffering,” Stegman said. Planning Manager Adam Birnbaum said opening days of the fair and races are worst-case scenarios and improvements at the corner “won’t be a panacea” for those days. Many residents suggested the project be put on hold until proposed projects, including Watermark Del Mar, a multifamily development on the southeast corner of the intersection, and improvements at the fairgrounds are completed. “It seems like this should be delayed because too many things can change,” one attendee said. “Why not wait?” asked another. Wilson said any future development in the area will be taken into consideration. Minicilli said project timing will be decided by the City Council. Not everyone opposes the roundabout. Many say traffic will flow more continuously, reducing noise and pollution from cars that idle or stop and go at a traffic signal. The California Environmental Quality Act includes a long list of items that must be studied, such as air and water quality, biological and cultural resources, land use, planning, noise and transportation. The scoping meeting was held to garner input on other environmental topics that should be included in the study. The draft EIR should be available for a 45-day public comment period in June or July. The final document is expected to be presented to council members this fall.